Coriander (Coriandrum Sativum) is a small plant of the Umbelliferae family. It is one of the most common and popular herbs of the Indian kitchen and an integral part of our cooking. It is an erect plant with tender stem. The leaves and stem have a sweet aroma are used to garnish and season the vegetables and curries. The leaves are also used to make chutneys, soups and sauces. The seeds when mature are dried and used in cooking. It is known as Dhania in Hindi. 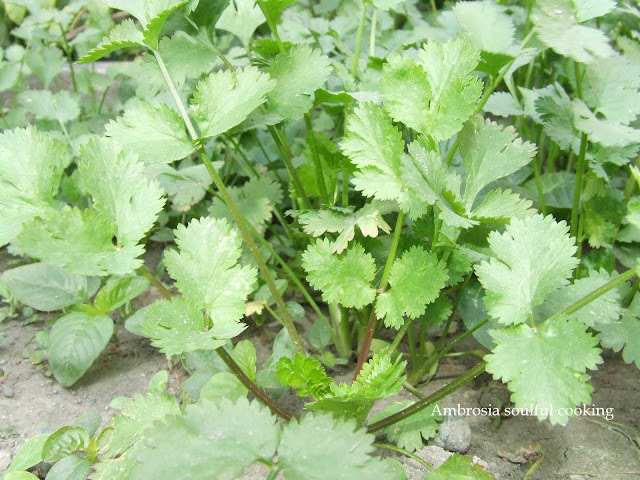 It is also known by different names like Cilantro and Chinese parsley. Coriander is a native of the Mediterranean region. It is extensively cultivated in India, China, Thailand, Europe, North America and South America. Besides imparting flavour and aroma to the dishes, it is also of great medicinal value. Coriander contains iron, calcium, phosphorus, carotene, thiamine, riboflavin, niacin, sodium, potassium and vitamin C. Coriander has been used in our traditional kitchen cabinet remedies since ages. It has always been used for treating indigestion, stomach ache and loss of appetite. Chutney made by grinding a bunch of fresh coriander, 3-4 buds of garlic with fresh lime juice, a little sugar and salt is a very good appetizer. It is had with the main meals. It improves appetite and aids digestion. Coriander is diaphoretic and gives relief in fever. It also gives relief in coughs, chest pains and dysentery. Coriander seeds are aromatic. Mature seeds are dried and ground. This powder known as dhania powder is used in cooking. It is used as a spice and is the main ingredient of garam masala and all the other masalas used in the curries. Coriander seeds also have curative properties and it is also called a “healing spice”. The seeds are rich in iron, magnesium, flavonoids and phytonutrients. It is also a good source of dietary fiber. The seeds have anti inflammatory properties and give relief in the painful symptoms of arthritis. It is diuretic and prevents urinary tract infections. Research proves that it lowers sugar, lowers bad cholesterol and raises good cholesterol. Coriander is carminative. It gives relief in nausea and alleviates intestinal gas. A decoction prepared by boiling seeds in water till the water quantity reduces to half is used to wash eyes in conjunctivitis. Similar decoction with sugar is used to check excessive menstrual flow. Coriander seeds and leaves help in halitosis. The seeds and leaves are chewed to stop bad breath. The kernel of the seeds is eaten as mouth freshener. A paste of coriander seeds is applied to treat the mouth ulcers. Coriander is considered to be both a herb and a spice. Oil obtained from coriander seeds has anti bacterial properties and is used to treat gas in the intestines, neuralgia and rheumatism. The oil is also used in the perfumes and a number of other pharmaceutical preparations. Coriander has been an integral part of our kitchen garden. It requires a lot of sun and well aerated soil. It should be sown during the onset of winters and can be harvested throughout the season. The seeds should be collected when they become brownish yellow. Coriander is available in abundance these days. Garnish your curries generously with it and reap its health benefits.